Georgia coach Kirby Smart gave mentor Nick Saban and Alabama a run for their money in the national championship game – and did it again in the offseason. “We can’t allow complacency to slip into our program and slip into our staff because I know that will eat away at the core fundamentals that we started to believe,” Smart said during Southeastern Conference media days. Alabama and defending SEC champion Georgia could very well be on a collision course for a championship again, though it’s more likely to be a meeting in the league title game this time. The Tide didn’t win the West last season after falling to Auburn in the regular-season finale. The Crimson Tide approaches the season widely regarded as the favorite to win a sixth national title in the last decade. That overtime win over his former defensive coordinator’s team did leave Saban with a months-long quarterback controversy: Heralded championship game hero Tua Tagovailoa vs. two-year starter Jalen Hurts . “We’re constantly looking for the next edge…” Smart said. The league welcomes five new head coaches, including Saban disciples Jimbo Fisher at Texas A&M and Jeremy Pruitt at Tennessee. Fisher returned to his SEC Western Division roots from Florida State after past stints at LSU and Auburn with a 10-year, $75 million deal . The primary SEC West challenger to Alabama might be defending champion Auburn, which returns quarterback Jarrett Stidham and has one of the league’s most talented defensive lines. But Fisher’s Aggies return 15 starters and Mississippi State has 17 back. South Carolina and Dan Mullen’s Florida seem the most likely to challenge Georgia in the East. East: Georgia. The clear division front-runner after making it to the brink of the Bulldogs’ first national title since 1980. 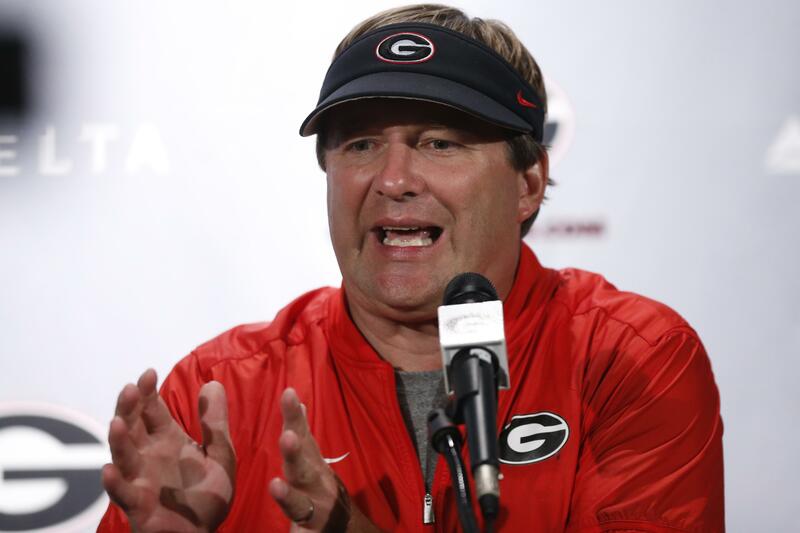 Kirby Smart must replace tailbacks Nick Chubb and Sony Michel, along with linebacker Roquan Smith and six other defensive starters. Quarterback Jake Fromm is back after an impressive freshman season (presuming he faces down a challenge from five-star recruit Justin Fields ). West: Alabama. With enviable quarterback options and strong front lines, the Tide remains the team to beat – even after a runner-up division finish to rival Auburn. The Tide defense must replace eight NFL draft picks and the entire starting secondary. Tailback Damien Harris is a stalwart in the offense. A.J. Brown, WR, Mississippi. Might have a hard time matching his huge 2017 numbers (75 catches, 1,252 yards, 11 touchdowns) if only because of QB Shea Patterson’s departure. Drew Lock , QB, Missouri. Led the nation with an SEC-record 44 touchdown passes, while flirting with 4,000 yards. First-team All-SEC quarterback. Deebo Samuel , WR/RS, South Carolina. Tied for the team lead in 2017 with six touchdowns – three receptions, one run, two kick returns – despite breaking his leg in the third game. Texas A&M’s Fisher, Florida’s Mullen, Mississippi’s sort of new Matt Luke, Arkansas’ Chad Morris and Mississippi State’s Joe Moorhead . Also Alabama has six new assistants, including the coordinators on both sides of the ball. On the field, Georgia tailback Zamir White and Alabama cornerback Patrick Surtain Jr. are among the potential impact newcomers. With five new head coaches, there are fewer in precarious situations. Vanderbilt’s Derek Mason enters Year 5 seeking his first winning season. Kentucky’s Mark Stoops and LSU’s Ed Orgeron might be in some jeopardy with big drop offs. Published: Aug. 13, 2018, 11:18 a.m.